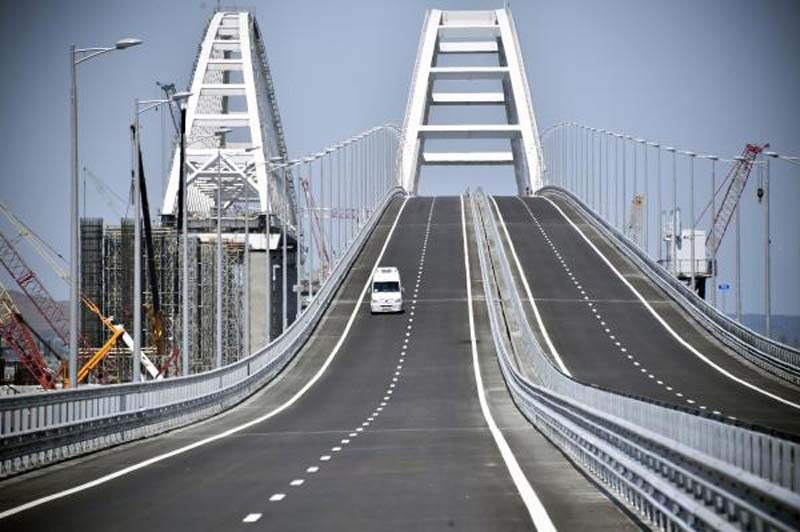 Kremlin President Vladimir Putin opened the Kerch Strait Bridge Tuesday -- a large connector that connects Russia's Krasnodar region with Crimean land Moscow annexed four years ago. Putin led a convoy of 35 vehicles across the bridge, which took 16 minutes to cross. "It is historic because in different historical epochs, even during the tsarist rule, people dreamt of building this bridge," he said at the ceremony. "Finally, thanks to your labor and your talent this project, this miracle has come true." The bridge, set to open to the public Wednesday, can handle 40,000 cars a day and move 14 million passengers and 13 million tons of cargo per year, RIA Novosti reported. Trains will begin crossing next year. Putin ordered the bridge four years ago and construction began in February 2016. He said Tuesday about 15,000 people and more than 200 businesses worked on the project. The bridge was ordered one month after Moscow annexed Crimea in March 2014, in a move that was internationally criticized. The annexation followed the ouster of Ukrainian President Viktor Yanukovych. The United States and most Western states have not recognized Crimea as Russian territory and have imposed sanctions over the move. Moscow has called the annexation a "restoration of historical justice." Two years ago, the U.S. Treasury sanctioned several companies involved in the construction of the bridge.